Oh Colleen, this is just beautiful! 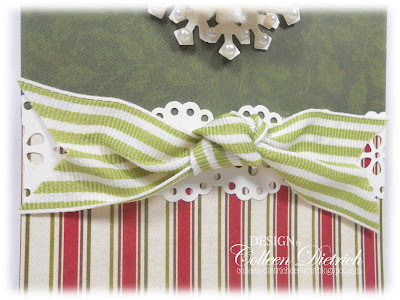 I love the felt flower, and the beautiful ribbon, the papers and the pretty punched border and pearls! Have a wonderful Christmas Colleen! 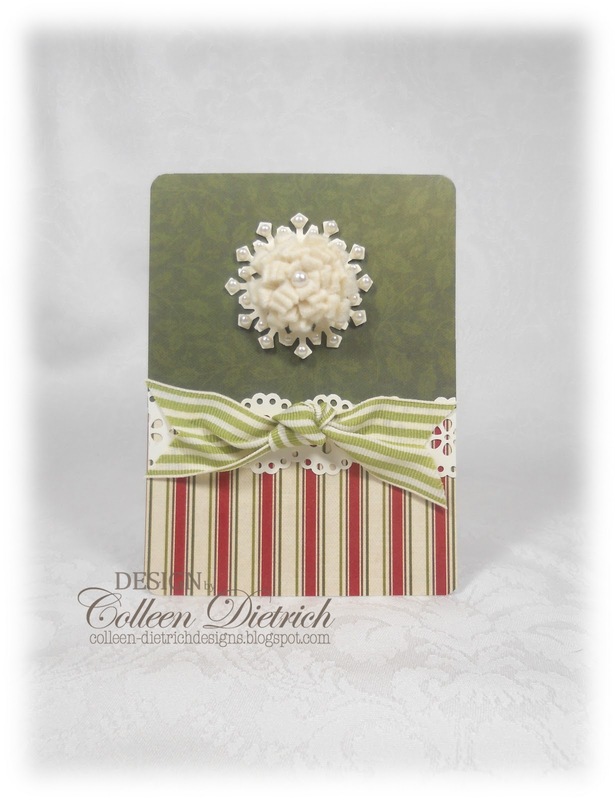 This is such a pretty card Colleen! I just love that felt flower-it is gorgeous. Merry Christmas to you and your family! what a fab card, colleen! beautiful felt flower! merry christmas! Just gorgeous! What a beautiful focal center piece to show off! That vanilla felt looks yummy! Beautiful job and you have given PDCC players some wonderful inspiration! Love this Colleen...so soft, delicate and beautiful! The pearls really accent that gorgeous snowflake marvelously! Great job with the colors, too! Am fine and too busy, how's life on your side?? What a beautifully, pearl-studded snowflake! LOVE! Merry Christmas! Oh this lovely that flower is a true stunner - so much texture and I love the added pearls. I'm hoping to join in the challenge again this week but lets see!! What a beautiful flower! And the snowflake with the pearls behind it make for such elegance! All put together in a fantastic card. Wow, I almost missed this post! So, glad I rescued it! This is just so fun! I really like the snowflake behind the flower and the pearls. But, the papers are really great too. Maybe one of these days I will get brave and try a challenge. Probably about the time pigs fly and yes, being from Iowa I do have a pig pin with wings that I love to wear! Again, happy holidaze! Simply gorgeous, Colleen! 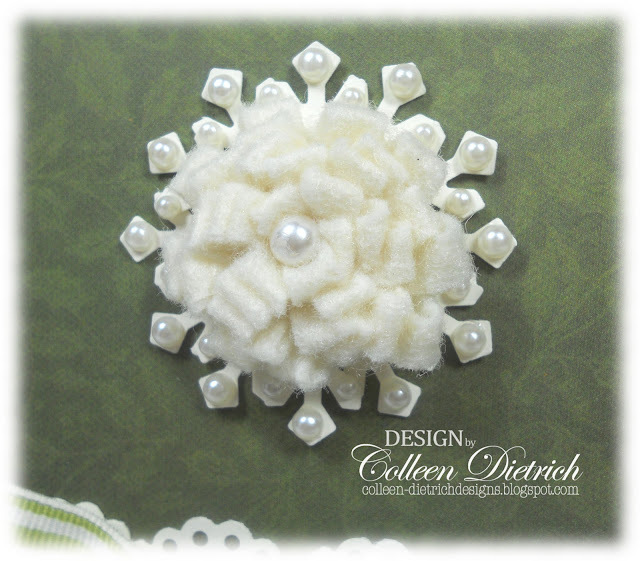 That loopy felt flower is perfect as the center to your snowflake, which looks amazing all decked out with pearls. Your clean design is so lovely, too. Great job with those fantastic colors! Stunning! I love the snowflake and your colors too! If I am not back before then, a Very Merry Christmas and Happy Healthy New Year to you and yours!! WOW!!! This is beautiful Colleen. Love the pretty felt addition to your snowflake! 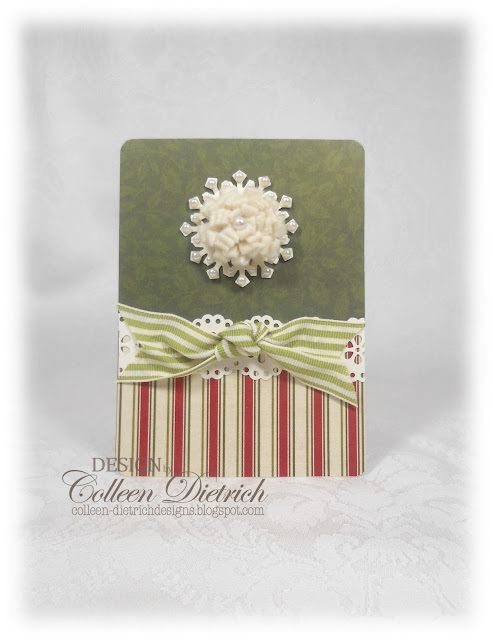 That felt flower look so pretty.. And your card is gorgeous..
Adorable snowflake, Collee! I LOVE this card! It is elegantly sweet! Colleen, this is beautiful! 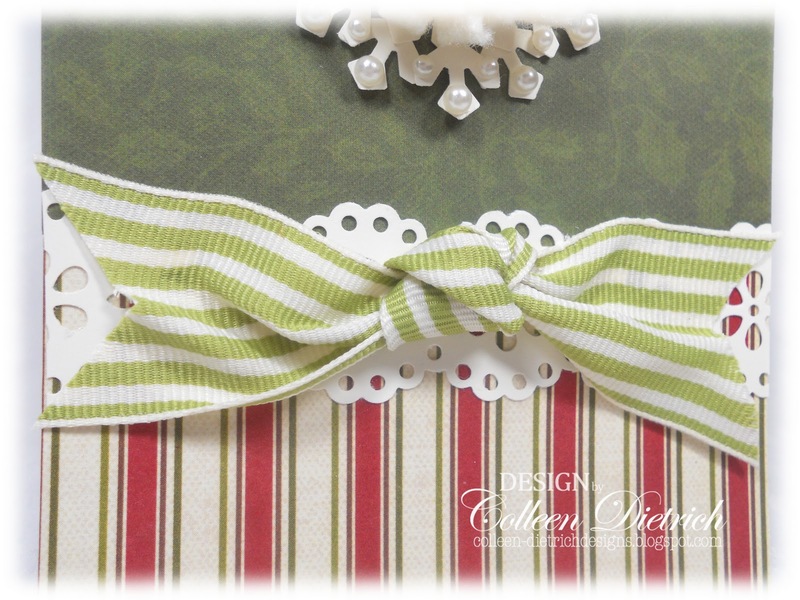 Your colors are dreamy-I love that bow and snowflake/flower combo. ;) Have a blessed Christmas! What a BRILLIANT use of the Fringe Flower Die!!! I absolutely LOVE the snowflake behind it! I must try this! Thank you for this beautiful design and fabulous post!